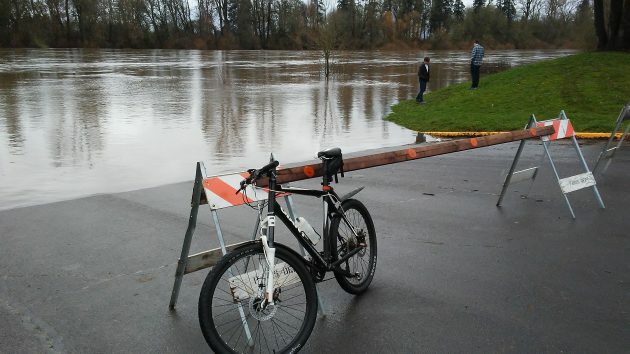 Thursday afternoon at Bowman Park: The river would rise about 2.5 feet by Saturday. Stopping by Bowman Park on the Willamette River on Thursday and again Friday, I was reminded once again of one of the chief benefits of the upstream dams. The water at the park rose a couple of feet and was lapping at the parking lot by Friday afternoon. By about noon on Saturday, it had risen almost another half a foot. That was the high-water mark, and by Saturday night the river level was again headed down. The river never came close to the “action level” of 21.6 feet on the Albany gauge, let alone the 25-foot flood stage. One reason was that the rain over the Southern Willamette Valley had tapered off. 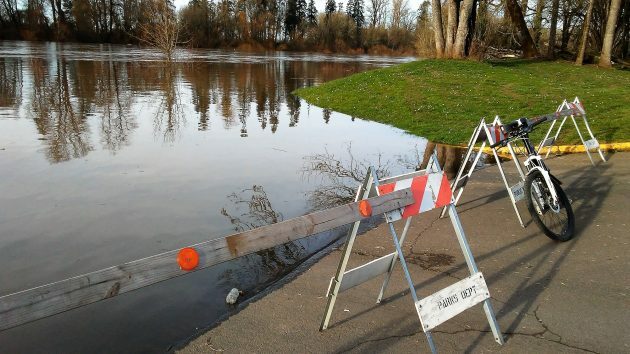 A bigger reason was flood-control management at the nine dams in the Willamette River Project that lie upstream of Albany. You can check the percentages of water in the eight storage dams and one regulating dam (Dexter) online here. The percentages tell you how full the lakes are in relation to their capacity. Blue River Reservoir on the McKenzie River, for example, was 68 percent full on Saturday, and it was 17 percent fuller than average for flood control on this date. At most of the other reservoirs the percentages were similar. My conclusion: If the Corps had stuck rigidly with its water control diagrams, it would have released more water downstream and there likely would have been flooding and perhaps some damage downriver. So instead the dam controllers considered current facts — snow depth, precipitation, weather forecasts and whatever else is useful — and adjusted their management to the real world. Smart, I would say. It probably takes someone with a memory of the area longer than the dams have been in existence to appreciate their benefits for flood control. As a rural grade school student in the 50s I would sit behind the school bus driver to see how many steps at the door the water would reach. The sofistication of managment of water releases from the dams is welcome and continues to save a lot of damage in this part of the valley.